A classy addition to your living room or den, this chair provides comfort at no cost to design. A plush 300CC welted cushion sits atop a sinuous suspension system for maximum comfort. 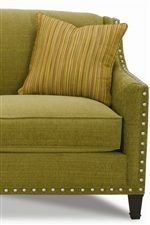 The chair rests on exposed wood legs and features an elegant brass nailhead trim. Tight cushion back and track style arms provide plenty of support while reading a book or holding a conversation in this chair. Give your feet a rest with the matching upholstered pillow-top ottoman. This Ottoman also features matching brass nailhead trim and exposed wood legs. The Rockford Traditional Upholstered Chair & Ottoman with Nailhead Trim & Exposed Wooden Legs by Rowe at Reeds Furniture in the Los Angeles, Thousand Oaks, Simi Valley, Agoura Hills, Woodland Hills, California area. Product availability may vary. Contact us for the most current availability on this product. K581-000 Traditional Upholstered Chair 1 29" 34" 35"
K58-000 Traditional Upholstered Ottoman 1 25" 22" 19"
Padding & Ergonomics 300CC cushions with optional FeatherSoft cushions - a modern and balanced blend of down, feather and fiber, channel quilted in a down-proof jacket that surrounds a high-density foam core. The Rockford collection brings a comfortable traditional feel to your living room. This collection offers a sofa, settee, sectional and chair to fit your living room or den. The collection is defined by its prominent nailhead trim on all pieces and the exposed wood legs that add to the traditional design. Seats of the Rockford collection feature welted 300CC cushions and a sinuous suspension system for comfort. Sofa, sectional sofa and settee come with welted 18" down throw pillows and tight backs with narrow track arms for support. The Rockford collection is a great option if you are looking for Traditional furniture in the Los Angeles, Thousand Oaks, Simi Valley, Agoura Hills, Woodland Hills, California area. Browse other items in the Rockford collection from Reeds Furniture in the Los Angeles, Thousand Oaks, Simi Valley, Agoura Hills, Woodland Hills, California area.